Now after the theorem there is the note that this theorem is also true if one or both of the one sided derivatives at the endpoints are infinite, and to prove that Apostol suggests using this function $ g(x) = f(x) - cx$. I understand the theorem and the proof of it but how do I use this function $g$ above to show the result?? I can show this a different way just by extending the result of the theorem above to cover for the infinite one sided derivatives but I still wonder how to use that function $g$ as suggested to show that?? any hints would be great. thank you. Let us explicitly assume that $f$ is continuous on $[a,b]$. Then $g(x) = f(x) -xc$ is continuous on $[a,b]$ and differentiable on $(a,b).$ $g$ is increasing at $a$ and decreasing at $b$. Therefore it must assume its maximum at some point $x^*$ in the open interval $(a,b).$ By Theorem 5.9 (page 109) of the same book we have $g'(x^*)= f'(x^*) -c =0$. Not the answer you're looking for? Browse other questions tagged real-analysis proof-explanation or ask your own question. 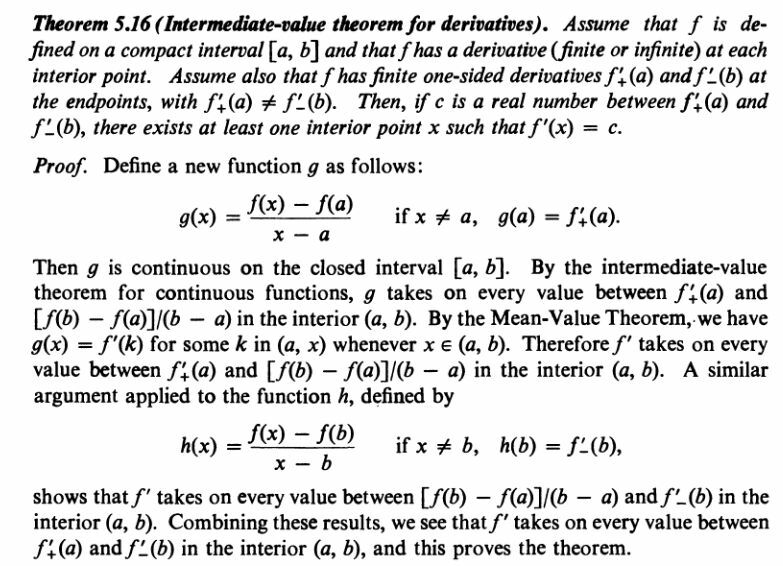 Intermediate Value Theorem and Continuity of derivative. Is every function with the intermediate value property a derivative?